Place steak pieces in a large bowl. Add all ingredients into bowl except, red bell pepper and onion. Mix well and cover. 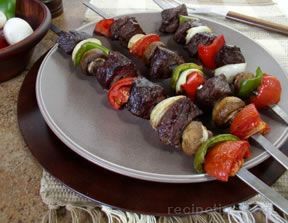 Place in refrigerator and allow to marinate for 1-4 hours. Preheat grill for medium heat. 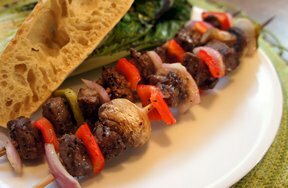 Thread beef, red bell pepper, and onion pieces alternately onto skewers. 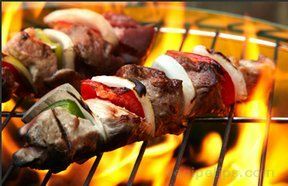 Place on grill and cook for 15-18 minutes, turning once. Remove from heat and serve.